This Celtic-inspired cross is an exquisitely detailed masterpiece, born of a collaboration between Calimacil and Atelier Fantastic Art. 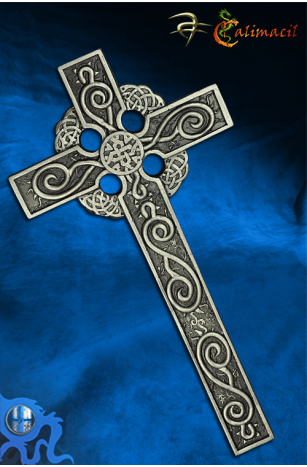 From the historical Celtic design to the delicate, almost imperceptible scrollwork and vine detailing along the shaft, this cross presents a durable, functional piece for your collection or your LARP character. Like all weapons issued from this exclusive partnership, the Avenging Cross weds a meticulous attention to detail with the high quality and excellent balance you've come to expect from Calimacil. It is safe enough for sparring, and beautiful enough to make any LARP enthusiast proud. Whether you are a wizard who collects ancient relics, an adventurer who likes to be prepared for anything, a vampire slayer with an entire arsenal of holy weapons, or simply a monk trying to protect his friends, this LARP cross offers you both a weapon that is rich in history, legend, and mystery.